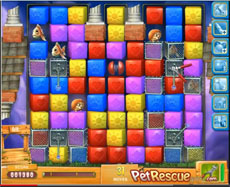 To beat pet rescue 492 you must destroy the wire creator machines with the line blasters that fall above the screen. Once you use a line blaster, another one falls from the top of the screen. In order to save moves you have to use the line blaster in the same line with the wire creator machines when they are unproctected from the wires. To do it use the mesh mash booster it gets activated while clearing the blocks. When you’ll have destroyed the wire creator machines, rescuing the pets is not a difficult task. The following walkthrough video will give you a few more ideas on how to complete level 492!